Since the time may vary based on the full moon, riders and horses, click here for updates. 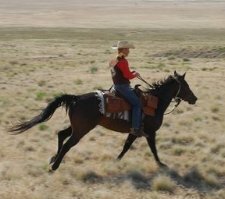 The annual re-ride is a 10-day, 24-hour per day, non-stop event with 500 riders and horses riding the 1,966 mile route. It is the longest event held annually on a historical trail in the nation, even surpassing the famed Iditarod. The route follows the Pony Express National Historic Trail from California, through Nevada, Utah, Wyoming, Nebraska, Colorado, and Kansas to Missouri. The Pony Express operated between 1860 and November 1861 with riders delivering mail and telegrams by horse relay between San Francisco and St. Joseph, Mo. The demise of the Pony Express was ushered in with the success of the railroad. 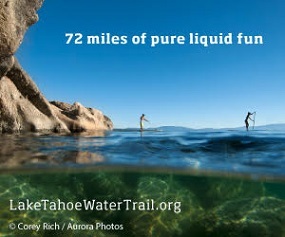 Today, part of the Pony Express Trail route is a multi-use trail located near Sierra-at-Tahoe. There are a few relay stations in South Lake Tahoe. One at Friday’s Station, just east of Harrah’s casino where the statue is today, and two others out in Meyers by Lira’s Market and the Hawley Grade Trail. Another station is located at Woodfords near Markleeville. Yank’s Station: Upon completion of the wagon road over Kingsbury Grade, the Pony Express route continued along the south shore of Lake Tahoe stopping at Yank’s Station Toll House, near Myers on U.S. 50. This was the easternmost remount station in California. It was also a trading post, hotel and stage stop. Friday’s Station was the point where the Pony Express riders crossed the California-Nevada line. “Friday” Burke and James Small were granted a franchise to operate a station along the western section of the Kingsbury Grade and Mac Donald Road. In the 1860’s Friday’s Station was an important remount stop for the Pony Express riders, and continued as a Way Station for the Pioneer stage lines and freight teams and wagons on the Bonanza Road. From Friday’s Station, the route takes the Kingsbury Grade over Daggett Pass into the Carson Valley. 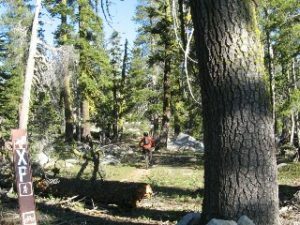 The Kingsbury Grade wagon road was built in 1860 by Kingsbury and McDonald as a replacement of the old Dagget Pass Trail. The new road shortened the distance between Sacramento and Virginia City by fifteen miles. This Pony Express Station was operated as a remount station at Cary’s Barn for five weeks when the service first began in 1860. The first white settlement in Alpine County was established here in 1847 and was known under several names. A Historical Marker is located in front of the current store on Old Pony Express Road, just east of the junction of State Routes 88 and 89. The riders all carried mail in a “mochila” or knapsack. The telegrams and letters transported by the Pony Express were carried in a mochila. The word “mochila” came from the Spanish word for knapsack. 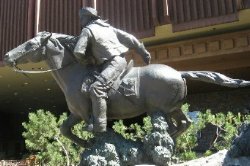 Although there have been other riders to carry the mail by horseback (Benjamin Franklin established post riders that carried mail in the East), it was the mochila that made the Pony Express unique. Mail pouches were never in use on the Overland Pony Express because of their size and shape, they would be difficult to attach to the saddle, and would cause undue delay in changing mounts. To get around this difficulty, a mochila, or covering of leather, was thrown over the saddle. The saddle horn and cantle projected through holes which were cut in the mochila. Attached to the broad leather skirt of the mochila were four cantinas, or boxes of hard leather. When the rider was in the saddle, his legs came between these boxes. The mail was put in these cantinas, which were locked with small padlocks. Station keepers at either end of the line, or at designated way stations, had keys to these boxes. Through the use of the mochila, it was not necessary to change saddles at all, properly speaking. When a rider arrived at a relay station, a fresh horse, saddled and bridled, was waiting for him. The rider changed the mochila from one saddle to another and was away, inside the two-minute limit allowed for changing horses. If a horse fell and was killed or injured, the rider could strip the mochila from the saddle and walk to the next station with the mail.